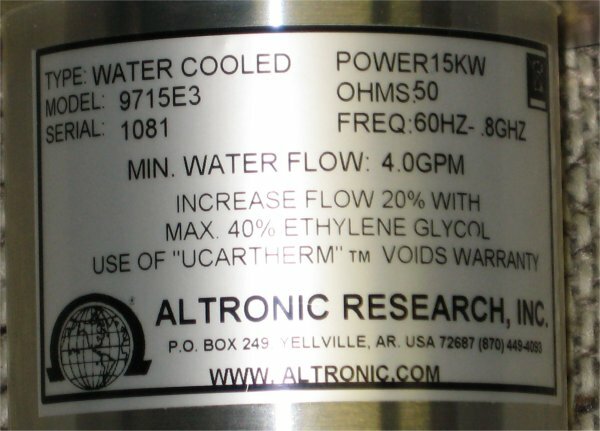 The Altronic 50 ohm coaxial load shown here is a water cooled device that I picked up some time ago. I am convinced that this load will last me for ever, and I'll no longer need worry about off air tests when running up a new or existing amplifier. The RF input is the 3 & 1/8 coaxial connection at the top of the load. In this picture I have an adapter that is fitted with the 7/16 socket that can just be seen at the top. It's simple enough; Water flow has to be confirmed, then use the load as you would any other load. I've no need to get anywhere near the rated RF capacity, and so I use normal tap water 'from the tap, to drain' gives me a good enough flow rate. Please note: Tap water where I live is 'soft' and low in impurities compared to that say or London, or Manchester.